Whilst it would be great for us to attend every invite we receive it's not always possible. 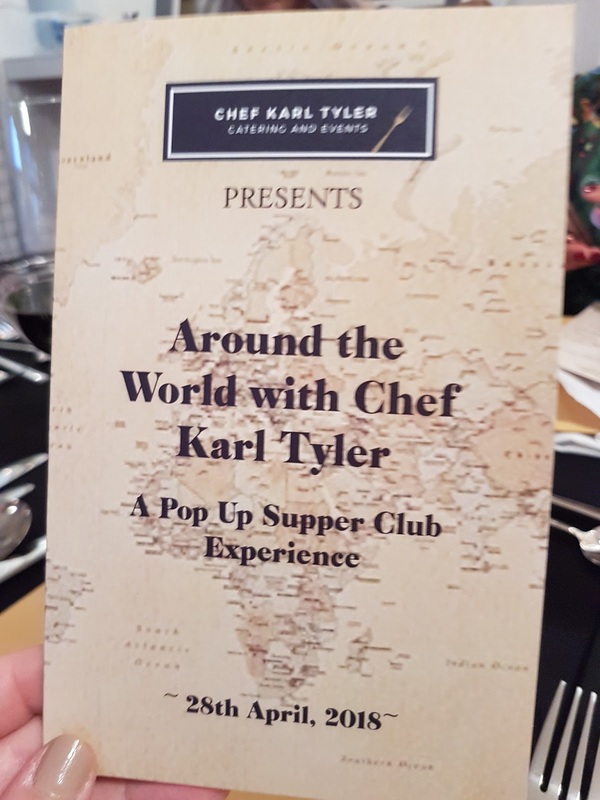 Sometimes on those occasions the invites we get are too good to miss so when we received an offer to visit the first of Chef Karl Tyler's Pop Up Supper Club's in Nottingham-we offered the opportunity to close friend Carly to visit in our absence. Carly's no amateur when it comes to food and has helped on pieces for the blog before. 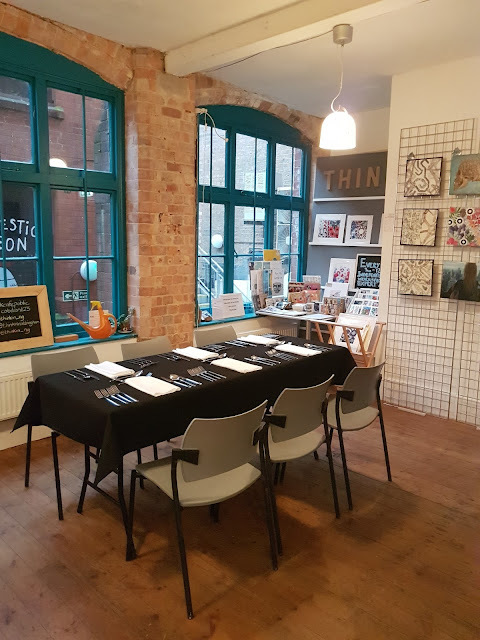 Her partner is a Chef at one of Nottingham's best known restaurants and she's very much a foodie at heart and willing to travel the length of the country for good food. Staff on arrival were warm and welcoming. Explaining the concept of the evening and how it would be served. We were also given a large envelope which contained some promotional materials as well as a wine list, a small menu envelope which you were told not to open, to keep the surprise of the meal and the chef notes which you could look at, which told you what the menu was, subsequently spoiling the surprise they wanted to be kept. The menu was a six sample menu with inspiration from around the world. The Amuse Bouche took it's inspiration from Europe and in particular Spain. 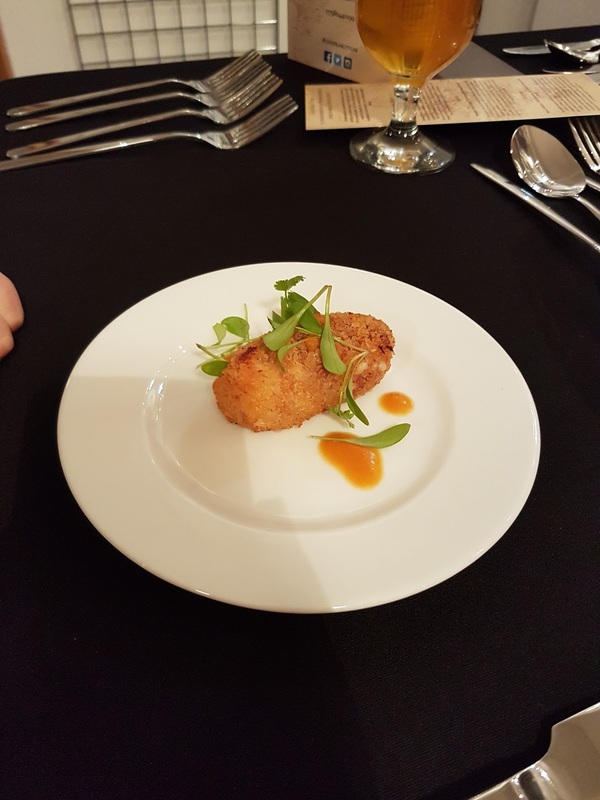 First plate was a beautiful looking Iberico ham croquette, filled with it an amazing filling which melted in your mouth, until I found a hair in it. The staff apologise and got me another and it was lovely. But you would think they would be more careful with paying guests, especially for the price as this is very much unacceptable. We were offered a drink as an apology by the team, we already had a glass of wine so this covered our drinks for the evening as we're not big drinkers- especially as were driving into town. 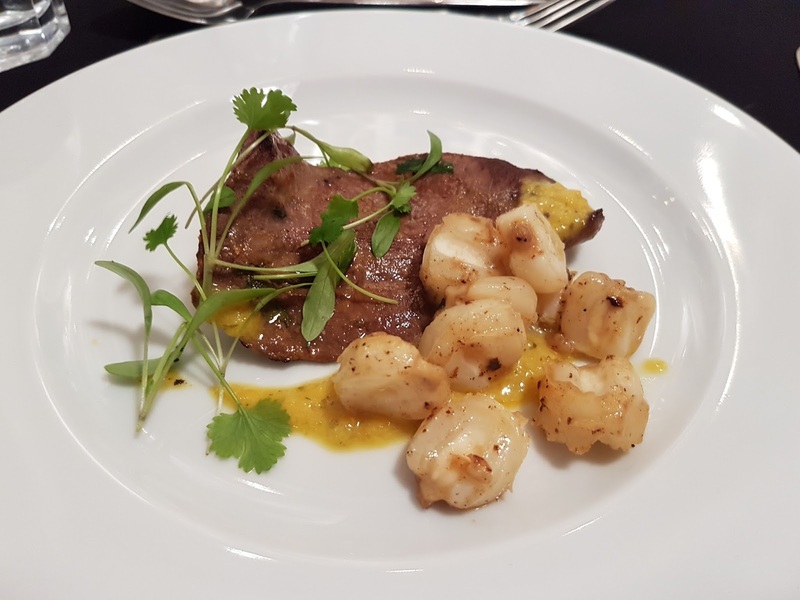 Second, a very brave choice because not everyone would like to it was Marinated ox heart, giant corn, yellow pepper & aji amarillo, coriander Cross. 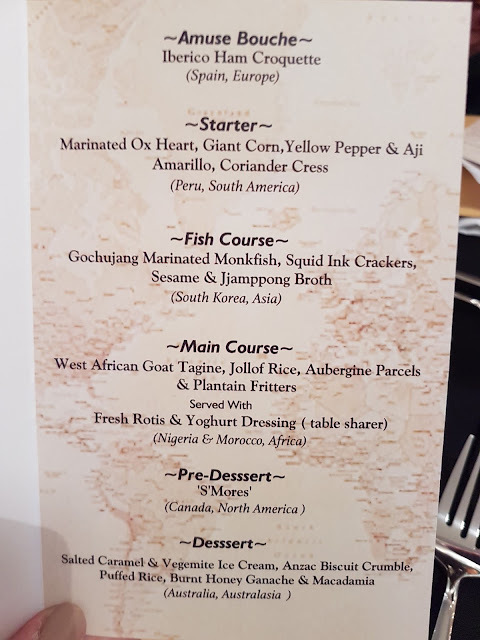 Personally it wasn't for us, it was a little bland, chewy and my portion was cold, the giant corn didn't really add anything to the dish but the sauce was lovely and full of flavour. However everyone else seemed to love the ox heart, explained it was always that consistency and not much was left on people's plate. Third plate course was cochunjang Monk fish,squid ink crackers, sesame & jjamppong broth. It was simply stunning, a Michelin quality dish. 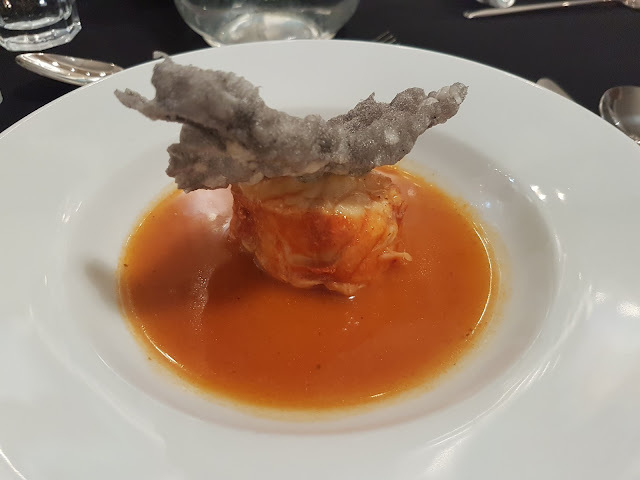 A perfectly cooked piece of Monk fish, in a sweet, savoury, spicy and perfectly balanced sauce which on its own was full of flavour but never overpower the fish. And the squid ink cracker added texture to the dish. This was by far my favourite dish, because it was complex in flavour and simplicity all at the same time. Fourth course came out after a 20m break to allow everyone to socialise with eat other. It didn't really work as everyone just carried on chatting with who the came with. 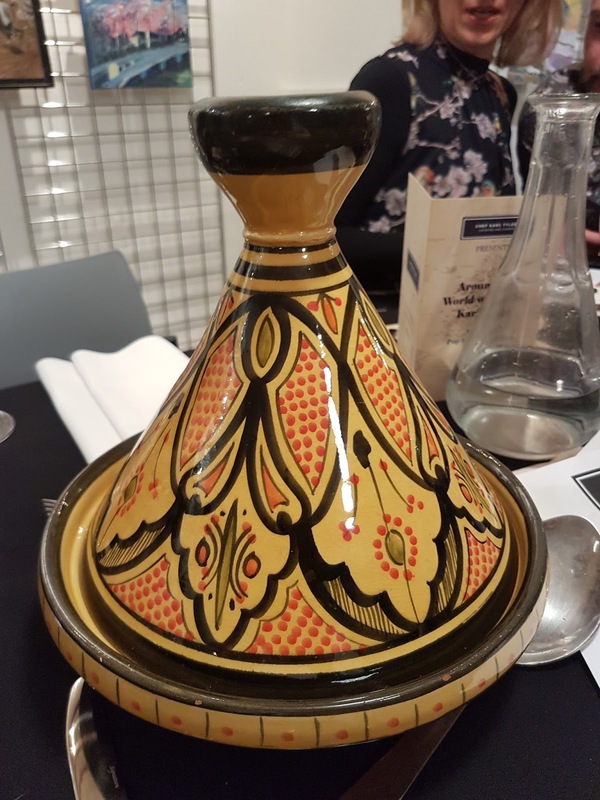 It was West African goat tagine, jollif rice aubergine parcels & plantain fritters with fresh royis & yogurt dressing to share, served in large sharing tagines with the other components served on a platter. Unfortunately by this point you could tell the evening hadn't been rehearsed. The tagines were brought out first, followed by a sharing plate of the other parts of the dish which we was told there was plenty of everything so just ask if you want more. Then 10 minutes later the pates you ate it off arrived. There wasn't enough of other parts to go round. On a table of 7 you expect 7 of everything not 5 of one, 3 of the other and 6 of something else. When we told them and asked for more as told we could they said there wasn't any more. Then after we all finished eating, a good 10min after, suddenly there was more. But the goat tasted lovely, the aubergine parcels were very nice, the plantain was tasteless and the rice was lukewarm. My biggest compliment is the fact all the plates and bowls were freezing cold, they had been in other courses but because they were only really a mouth full it didn't matter. But the main show stopper meal was barely warm and mostly cold by the time we ate it. And really what chef who has worked in Michelin star restaurants serves food on cold plates-even Wetherspoons don't do that! Fifth coarse called the pre-dessert was however impressive a lit gel burner was placed on your table followed by 2 gram crackers, a small piece of chocolate and a homemade marshmallow on a stick, with verbal instructions on how to make smores. 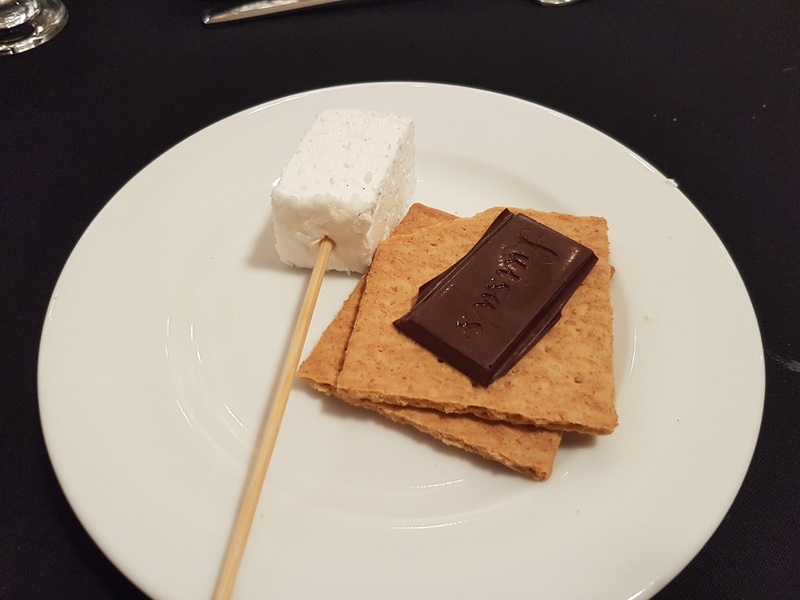 This was lovely and interactive, a real talking point and quite clearly chef Karl's partner favourite part of the evening as she wax explaining how to do it and saying to burn the Marshmallows a little for flavour. It was simple but really satisfying on many levels. 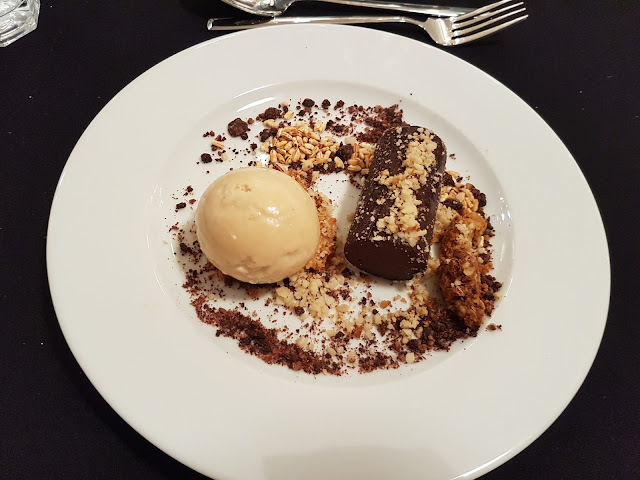 Sixth and final course salted caramel & Vegemite ice-cream, Anzac biscuit crumble, puffed rice, burnt honey garnash & macadamia. The ice-cream only tasted of salted caramel, there was far to much of hard chocolate ganash, and all the crumbs, and rice didn't add to the dish it just looked messy. And after the super sweet smores, the dessert need to be lighter. Like something fruity, a posset or a cheese board. Not something as over powering as that. Also this wasn't served to us till nearly 11.15 and by that point I wanted something less. 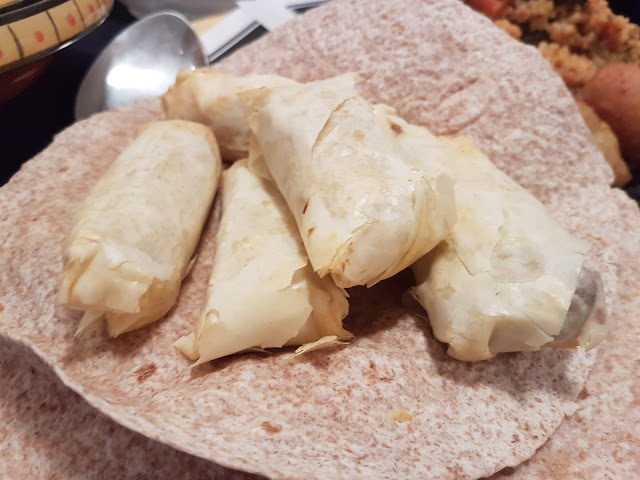 Overall it was a nice night, it was chaotic in places, the staff didn't always know what was happening, most of the food was either cold or lukewarm because of cold plates. And most dishes were served with a beer to go with them but most agreed that it wasn't always a good match. And I know he was limited by the space and tables he had but if he wants a supper theme, then round tables would promote conversation and a more social dining experience. Not putting the chef notes in the envelope to spoil the menu would of been a better idea and sitting there from 7.30 and not getting your final dish till 11.15 isn't for me. Some dishes were nice, the fish was excellent. But would I have paid the £60 each. No, personally not, I have paid roughly the same amount at places from the likes of Tom Kerridge, James Martin, and Gordon Ramsey and had much better food and much better service.